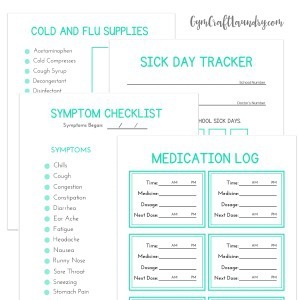 Don’t be caught without your sick kid toolkit again! Let’s be honest, you don’t have a sick kid toolkit in your house right now. Guess what? You need one! Kids get sick when you least expect it, so be prepared. Every time my kids get sick, I have to run to the store to get medicine. Keeping things you’ll need at a time when it won’t be convenient to go to the store is my best practical parenting tip. If you don’t have one, it’s time to create a Sick Kid Toolkit. Here’s what you should have in your Sick Kid Toolkit. For some reason, I can never find our thermometer. I actually bought a cheap one just for the Sick Kid Toolkit. No point in buying a super expensive one when they seem to disappear all of the time. You can pick a couple up at the Dollar Store, just to have on hand. Usually, when my kids get sick, I have to rewash their bedding to help get rid of the germs. I grabbed an extra pillow and blanket from our extra stash. I don’t know about you, but it’s always so nice to feel cozy when you’re not feeling good. These are the three medicines that I keep in our Sick Kid Toolkit. Pfizer Consumer Healthcare and Target were kind enough to provide me with a product bundle of these three medicines. I keep several bottles Children’s Advil® stocked at all times. Pea’s Juvenile Arthritis has improved to the point that she is off of the heavy medications. Now when she has a small flare, we use Advil and it works like a charm! Whether your child’s not feeling well, has a fever, or has come down with cold symptoms, it’s nice to have all three on hand. Sometimes one of my kids may have a cold and the other a fever and they’re two different sicknesses. I LOVE to be prepared, so these 3 medicines are a must in our kit at home. My kids are like super thirsty dinosaurs whenever they are sick. I have special water bottles they use when they’re sick. Mostly because I don’t want them spreading their germs and also because they are spoiled. When they’re done, I make sure I sanitize it to kill all of the germs and then put it away for the next sick day. If there is one thing a kid needs when they’re sick, it is rest. The only way I can get my kids to sit still when they’re sick is by letting them watch movie after movie. I keep copies of our favorite movies in our Sick Kid Toolkit. Plus, since my kids are getting older, having an excuse to cuddle with them is always fun. What do you keep in your Sick Kid Toolkit? This post was sponsored by Pfizer Pediatric at Target. All thoughts and opinions are my own. I love elderberry syrup for re-hydration, too. I hope that your little ones don’t get sick this summer, though. I hope my kids stay well this summer too. They spent their toddlerhood and preschool years ALWAYS sniffling. Luckily they haven’t caught as many bugs the last couple of years. I hope I didn’t jinx myself.